Sorry for the delay of this email, we are still in our honeymoon in Puerto Vallarta. WOW!!!!! The cake was amazing. It was everything I imagined and more. I was so pleased with it and we received many compliments. I'd like to thank you for the beautiful cake. It taste great and everyone loved it. The cake was beautiful and was the hit of the party. Beautiful work! Roxana's cake on the site here is the cake from our wedding...Her picture does no justice...It was exquisite...and something we never expected. We gave her our colors and a picture of the centerpieces my mother did and we left it all up to her..she did it all.right down to decorating the Cake table ....she is a true artist. I will keep in contact for further events...and I will recommend you as well! I am Maria (ultrasound tech/Dr russo's) I checked out your website and want to let you know that your designs are so gorgeous. I will keep you in mind for my next celebration and also would love to refer you to anyone I know. Great job and good luck! It was a pleasure meeting you & your husband. I just wanted to say thanks again for the beautiful cake. My daughter LOVED it,so did everyone else. My daughter is already talking about you doing her Christening cake & a friend asked about you for her daughters Baby Shower cake too. It was a huge success. Yes!! She loved the cake and she said it was Delicious!! Thank you so much for your services. You have been extremely accommodating and professional. If I ever need a cake for any of my clients or myself, I will definitely come to you. I just wanted to thank you for the beautiful cake and favors for Nicci's shower. It was wonderful and delicious. Everyone asked where I got them and my daughter love it! I loved the dulce de leche cake!!!! It was very good and moist and the flavor was so delicious. I'm so glad that you may be getting more business. You truly are an artist!!! I want to thank you for baking us a great Cake!! It really was very beautiful. Sorry this is late in coming, but thank you so much for the FABULOUS fire truck cake and cookies. His favorite part--the black wheels, which made his mouth and hands very black, which he thoroughly enjoyed, as you can see in the picture. The front part of the cake came home with us from the party, and he played with it for a couple days before we had to retire it. 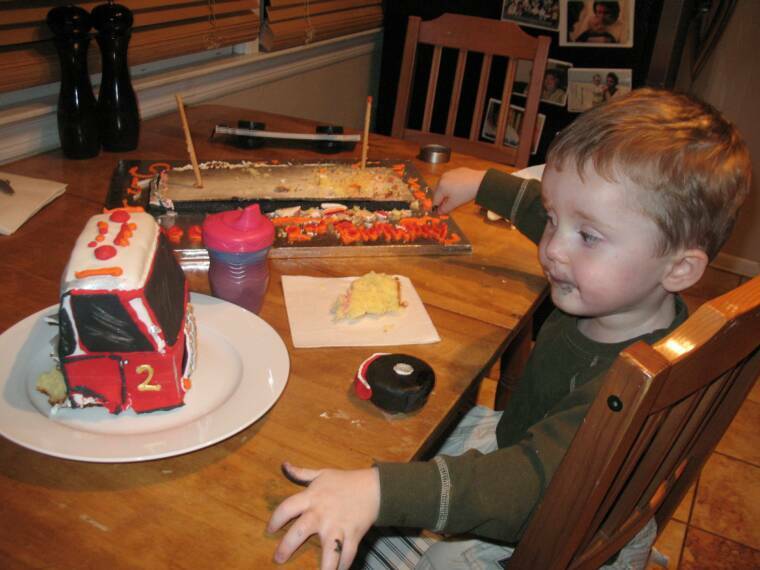 I think even more than the cake, he LOVED the fire engine cookies--he ate so many of them that I didn't have enough for his day care class--oh well, they were for him, anyway, so all the better. Thank you again, and I can't wait for George's next birthday, as well as my twin daughters! I can't wait to see what they want next time! .Dear Roxana: I Just wanted to thank you for all of your efforts- the cake you made for my daughter was the "talk" of the shower. Your phone call before the shower to assure me the cake was delivered and in place was without a doubt the nicest thing you could have done. Having two daughters, I have had several showers already- you were the nicest person I have delt with yet.. My only regret is that I didnt know of you sooner. And the cake was so beautiful!!!!! I got to the restaurant and the first thing I saw was your beautiful cake- just the sight of it made me smile (and relax!) It tasted as fresh and beautiful as it looked!! I highly recommended you to everyone there- which, I really didnt have to as your work spoke for itself!!!! Hopefully all the pictures of the cake I took will turn out. Thank you again for making my daughter's (and my new grandchilds) day so very special! I only wish for you tons of good luck and success for what is sure to be a bright and beautiful career!!! Roxana - The cake was great! It was beautiful and tasted wonderful. You will be getting calls in the near future since so many people inquired about the cake. Thanks for helping to make the day special. 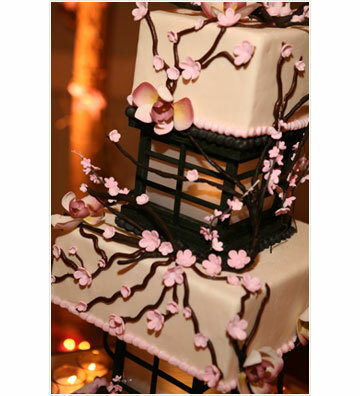 I couldn't believe how the cake matched the decorations perfectly in color and design. You did a wonderful job. Thanks again. Roxana Thank so much for a beautiful Cake! I got so many Compliments mit-everyone love it. you are truly Talented ! I will definetly keep your contact info for the next time ! First I want to say is THANK YOU!!!!!!!!!!! The cake was the most adorable thing I’ve ever seen! And it tasted as beautiful as it looked. Everyone at my baby shower absolutely LOVED IT! I cannot thank you enough for the time and effort you put into making my cake, it came out BETTER than what I was expecting. I will recommend everyone I know to use your cakes for their next big event. I can’t wait till my baby’s 1st birthday so you can create my next cake! Again thank you soooooo much! Roxana hola como estas, Te escribo para agradecerte por el cake de Matthew, it was out of this world! Estuvo spectacular, hubieras visto la cara de Matthew de contento con su cake. Imaginate que los ninos no querian comer los cupcakes, estaban parados al frente del cake mirandolo y me decian que les corte cake jajaja, que ellos no querian cupcake si no el cake! Thank you so much for everything, te pasaste and you made Matthew’s day extra special! Dear Roxana,Thanks for the beautiful cake. It was a hit. Our family & friends were in awe. We'll employ your services for our future events & will refer you people. Though brief, it was nice to meet you in person. Thanks again. they came out beautiful everybody loved them and it was very unique. they were the talk of the party and it was just perfect for the tinker bell theme that I had. I cant thank you enough and I am so glad I found you because you made my daughter first cake unbelievable. Thank you for the amazing Minnie Mouse Birthday cake for my twin daughters' birthday party. Not only was it beautiful, but it was so delicious and incredibly festive looking. Everyone at the party walked up to see the cake at least twice because no one had ever seen anything like it before. Everyone was in "awe" complimenting the many details and festive colors. The kids kept asking me all through the night when would they be able to have a piece. I loved the flower cup cakes that surrounded the cake. They were so detailed and it made it so easy to pass out to all of the children. The cake was one of a kind and one all of my guests and I will always remember. The cookies with their pictures on it were most impressive! They were so cute, no one wanted to eat them. They added such a sweet touch to the party. Thanks you for being so kind and taking your time with me on the phone every time I called to discuss the cake. It was amazing how you were able to make the Mickey Mouse Club House and have the cup cakes that surround it as flowers in a flower pot. That is exactly what I wanted! You are extremely talented and very creative! I look forward to having you make more cakes in the future for my daughters' birthdays. Once again, thank you ever so much for all of your hard work! I will recommend you to all of my family and friends. Dear Roxana we want to say thank you so much for the beatifull diaper bag cake for the twins baby boys, everyone love it. it was the talk on the party also the combination on flavor was ecxelet. Again Thank you so much. I just would like to tell you thank you very much for the cake. The cake was beautiful and we really enjoyed it. Roxana thank you soooo much for the wonderful cake you did for my son the perfect cheeseburger it was delicious, everybody loved it. Thank you so much for the beautiful wedding cakes. They were exactly as I imagined and I loved the designs. I only got to taste the red velvet but it was delicious. Everyone loved the Titans helmet cake! Thank you so much! I left a review on Wedding Wire for you. Just wanted to say that the cake was a hit! Everyone looved it!! I've been meaning to email you since last week, but I wanted to say THANK YOU soooo much for the beautiful cupcake tree for Jamie's shower. I got so many compliments and Jamie was thrilled with it...it was EXACTLY what she wanted. The cookies were a big hit as well. Everything was perfect!! I've been a little busy, but I wanted to thank you for the wonderful cupcake tree that you made for my mom. Once again everyone loved your work. They couldn't believe all the detailing on the cake. It was amazing! I'll be contacting you in October for the baby's first birthday. FYI - We're having a lego themed birthday so you can get as creative as you can.
.**My cake was delivered in tact on time and beyond my expectations..
** Can't Wait for next Year!! Thanks for the lovely cup cakes! You guys made just in time. We forgot to give you the tips for delivering the cakes to us.